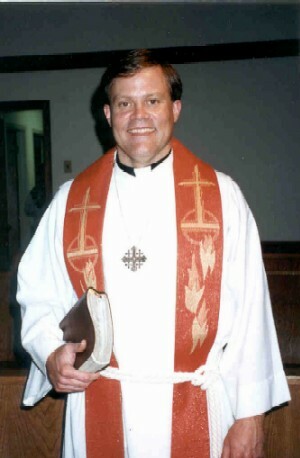 Pastor Mark Dankof in the 1990s. Thus hath the Lord God shewed unto me: and behold a basket of summer fruit. And he said, Amos, what seest thou? And I said, A basket of summer fruit. Then said the Lord unto me, The end is come upon my people of Israel; I will not again pass by them anymore. . . . Behold, the days come, saith the Lord God, that I will send a famine in the land, not a famine of bread, nor a thirst for water, but of hearing the words of the Lord: And they shall wander from sea to sea, and from the north even to the east, they shall run to and fro to seek the word of the Lord, and shall not find it. And unto the angel of the church in Smyrna write; These things saith the first and the last, which was dead, and is alive; I know thy works, and tribulation, and poverty (but thou art rich) and I know the blasphemy of them which say they are Jews, and are not, but are the synagogue of Satan. Fear none of those things which thou shalt suffer: behold, the devil shall cast some of you into prison, that ye may be tried; and ye shall have tribulation ten days: be thou faithful unto death, and I will give thee a crown of life. He that hath an ear, let him hear what the Spirit saith unto the churches; He that overcometh shall not be hurt of the second death. All of us here today have been on an odyssey since birth. We trace our voyage from infancy through childhood; from childhood to adolescence and young adulthood; from young adulthood to middle age; from middle age to old age; from old age to death, which the Christian defines as a transition from this present life to a new life in a new plane of existence with the Triune God, the Lord Jesus Christ, and all of the Saints of God in a place called Heaven. It was 45 years ago today that I began my long odyssey from childhood to adulthood. On June 23, 1967, my parents, my older brother, and I embarked on the USS Lurline, departing Honolulu for a 5 day journey to the Port of San Francisco. Our years together as an Air Force family living in Hawaii were coming to a swift end. I remember wishing that there had been more time. The legendary Matson Lines liner, SS Lurline. There are times at night when I can still hear the Matson Lines Orchestra and Band striking up the haunting strains of Aloha Oe, even as I still occasionally feel the Lurline beginning to physically pull away from the dock in Honolulu. As we began to depart, the ship was accompanied by a farewell flotilla of escorting canoes comprised of paddling Polynesian men and women. The women were decked out in Hawaiian tribal garb with bright colors. Their long, beautiful black hair was adorned with careful arrangements of the orchids of the Islands. The huge crowd standing on the dock in Honolulu waved good bye to the departing until we were out of sight. There is still one face I see above all others in that sea of humanity bidding tearful farewell to the denizens of the USS Lurline. It was Pastor Frederick L. Von Husen of Trinity Lutheran Church and School in Wahiawa. The three years at his school, and my Baptism in his sanctuary, began my long journey in Lutheran Christianity, a wandering that in the providence of God continues to this day. 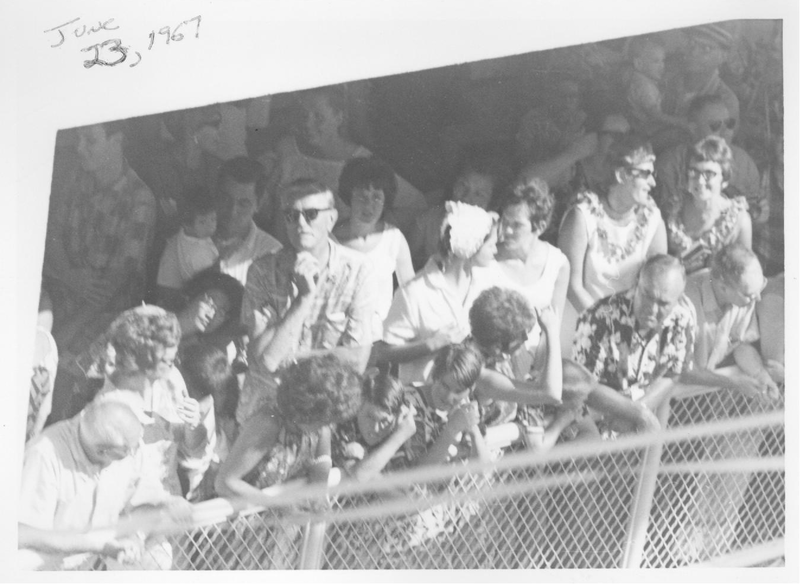 Pastor Frederick L. Von Husen of Trinity Lutheran Church and School in Wahiawa, Hawaii at the Dock of Honolulu on June 23, 1967, bidding farewell to Mark Dankof and family as the USS Lurline prepares to depart for San Francisco. I did not want to leave the loving confines of Christ-centered Church and School in Hawaii in June of 1967. The USS Lurline was taking me on a voyage to an ultimate destination I wanted to disembark from. “When thou wast young, thou girdedst thyself, and walkedst whither thou wouldest: but when thou shalt be old, thou shalt stretch forth thy hands, and another shall gird thee, and carry thee whither thou wouldest not. This spake He, signifying by what death he should glorify God. And when he had spoken this, He saith unto him, Follow me.” (John 21: 18-19). Mark Dankof in Geek Days. 3rd row, center position. 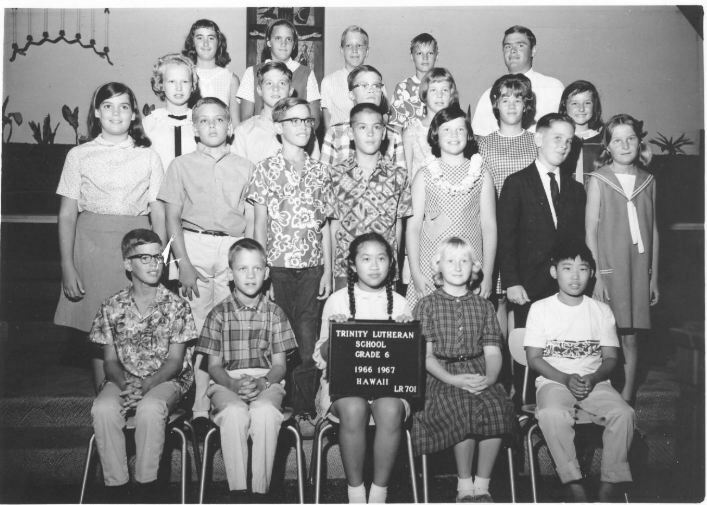 Teacher Paul Wangerin in back row, far right. Trinity Lutheran School, Wahiawa, Hawaii. 6th grade. School Year 1966-67. Those initial years as a child at Trinity Lutheran were rooted in a love of The Lamb and of God’s Word which testified to Him in the sunshine of childhood on Oahu. As the years passed, I would more than occasionally experience a darker side in American Lutheranism, what Eugene O’Neill would have termed A Long Day’s Journey Into Night. The painful journey which began on the USS Lurline in 1967 was often accompanied by queasy turbulence and darkness as the speed of time in an increasingly ominous Age accelerated, even as my own encounter with the Theology of the Cross deepened in time. The Lord seemed to be suggesting that I was being prepared to go places I didn’t want to go, on assignments no sane person would volunteer for. 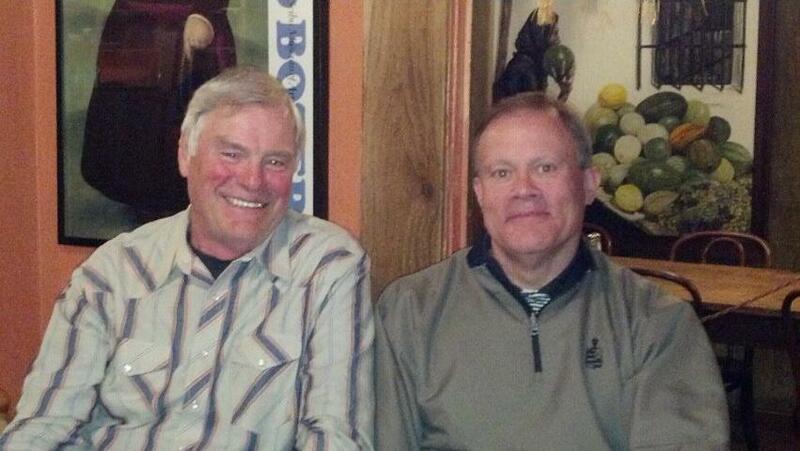 Paul Wangerin and Mark Dankof at El Mirador in San Antonio in March of 2012, 45 years after Teacher and Student days at Trinity Lutheran School of Wahiawa, Hawaii. One of those assignments was to be a Watchman 25 years ago in the initial salad days of the American Association of Lutheran Churches (AALC). Those days, my role in them, and the historic events then which overtook many of us in this sanctuary now, are the reason for my acceptance of an invitation to be here in Wisconsin on June 23, 2012. We cannot know who we are today as a Confessional Body of Faithful Believers standing in the Reformation loci of Sola Scriptura, Sola Christus, Sola Gratia, and Sola Fide, and presently residing in the Lutheran Ministerium and Synod–USA, without understanding the situation of a quarter of a century ago in our predecessor body, anymore than anyone of us can possibly know who and what we are as individuals today without intimate acquaintance with, and memory of, our own historical pasts. In short, we cannot know who we are, if we do not know where we have been. You are invited to share today in only a small segment of my own journey that began almost half a century ago in the Hawaiian Islands as a child. I hope that my journey illumines the remainder of your pathway as a child of God before the Lord returns. Come, Lord Jesus, Come. It is my great pleasure to be in attendance at a National Convention of the Lutheran Ministerium and Synod—USA. Dr. Ralph Spears has asked me to address all of you, keeping the theme of The Watchman in mind, and my past role in the American Association of Lutheran Churches (AALC) serving as one laboring under very painful circumstances that would subsequently come perilously close to destroying my life. The aftermath has impacted me in all the days and nights since that time. For the record, Ralph Spears and John Erickson have stood by me for the last 23 years in the aftermath of the most horrific events of my career in Word and Sacrament ministry. They have never left me behind in all this time, even as a number of people in strategic positions in the AALC years ago did, not only to my detriment and longtime exile, but to the detriment of many rank-and-file Lutherans out of the old American Lutheran Church who made the same initial mistake that I did in believing that we had found a confessional fellowship and home in the midst of the larger darkness that has enshrouded American Lutheranism in my lifetime. That darkness accompanies the blackening clouds swirling above our country, clouds soon to pour down God’s verdict of condemnation upon a nation and institutional church that have collectively rejected Him. “Thou turnest man to destruction; and sayest, Return ye children of men. For a thousand years in thy sight are but as yesterday when it is past, and as a watch in the night. Thou carriest them away as with a flood; they are as a sleep: in the morning they are like grass which growth up. In the morning it flourisheth, and groweth up; in the evening it is cut down, and withereth. “For we are consumed by thine anger, and by thy wrath are we troubled. Thou hast set our iniquities before thee, our secret sins in the light of thy countenance. For all our days are passed away in thy wrath: we spend our years as a tale that is told. Thus, I briefly delve into a journey into the distant past, without rancor or bitterness and hopefully with Biblical perspective. I speak of these matters all these light years later, only because requested to by Pastor Spears, and because of the way in which the events and circumstances of a quarter of a century ago serve to illustrate and warn The Remnant in these presumably final days of human history. The final days of human history, chronicled by Jesus Christ in the Olivet Discourse (Matthew 24, Mark 13, Luke 21), have many parallels with the beginning of the end for the Northern Kingdom of Israel as Amos proclaimed it during the reign of Jeroboam II (Co-regency with Jehoash from 793-782 B. C.; sole reign from 782-753 B. C.; total reign 792-740 B. C.); with the Babylonian Exile of the Southern Kingdom of Judah which culminated in Nebuchadnezzar’s destruction of the Temple in Jerusalem in 586 B. C.; and the national judgment of Judah at the hands of Titus and the Romans in 70 A. D. because of the former’s rejection of Jesus Christ and the nature of the Kingdom of God He proclaimed during His First Advent. This last catastrophe was forecast by Jesus in the Olivet Discourse, shortly before His betrayal by Judas Iscariot and the climax of the plot against His life launched by the Jewish religious authorities of first century Palestine. This is the critical perspective we must have on what has happened to the United States and to the Lutheran Church in your lifetime and mine. For the record, I was the first Lutheran pastor in “days passed away“ [Psalm 90: 9] to be formally accepted onto the clergy roster of the AALC, on July 10, 1987. In those days, I was a young man, and serving a Lutheran congregation in Seattle, Washington known as St. Matthias Lutheran Church, which would subsequently be among the Charter Congregations comprising this daring venture into the Great Unknown. All across the country then, there was much excitement among the early trailblazers in this endeavor and journey of faith. I shared in this Great Hope of that brief moment in time, feeling that after years of heartache in the Lutheran denomination, I was not only experiencing a turning point in my own life and calling, but witnessing a turning point in American Lutheran history that would define the future course of countless Lutheran Christians at the end of the 20th century and the beginning of the 21st to follow; a course destined to merge theological orthodoxy, love, and personal witness for Christ as the Church of Smyrna did in the dark early days of the Roman Empire and its persecution of disciples of Jesus Christ, accompanied by the Apostle John’s exile to Patmos at the hands of Emperor Domitian (A. D. 81-96) [Revelation 2: 8-11]. But darker, demonic forces were also afoot in the AALC between 1987-1989. Events in that two year period of time would force me into a public role as The Watchman. I did not seek this assignment. The role sought me, for reasons only partially understood 25 years later. “Take heed that no man deceive you. For many shall come in my name, saying, I am Christ, and shall deceive many. . . . And many false prophets shall rise, and shall deceive many. And because iniquity shall abound, the love of many shall wax cold. . . . (Matthew 24). With these Biblical passages in mind, the three trends of Satanic infiltration in the AALC’s early days that I observed as a Watchman are as follows: 1) the attempts at the outset of the Higher Education Committee of the AALC to establish a Lutheran House of Study in conjunction with Fuller Theological Seminary in Pasadena, California; and the involvement of the AALC’s Executive Committee in those days in using representatives of the C. Peter Wagner Church Growth Institute of Fuller Theological Seminary, like Carl George, for seminars on how to create AALC congregations based on the principles of the Church Growth Movement(CGM); 2) the early embrace of key leaders of the AALC of the most radical elements of the Neo-Pentecostal and Charismatic Renewal Movements in the Lutheran church, even as it was claimed that the AALC was a continuation of the older American Lutheran Church (ALC) and the Lutheran Orthodoxy that once characterized that Synod; and 3) the attempt to synthesize a full subscription to the Lutheran Confessions (“quia“) with the inclusion of advocates of CGM, the Charismatic Movement, and Dispensational Premillennial eschatology and Christian Zionism as full fledged members of the AALC. This underscores a truism: The attempt to synthesize truth and falsehood courtesy of the Hegelian Dialectic is destined to fail. This methodology is the enemy of Biblical Revelation and the Orthodox Lutheran Confessions. You and I cannot forget this. Ever. Daniel’s 70th Week: Past Fulfillment or Future? One of the 3 Persian Decrees: 538, 458, 445 B. C.
One of the decrees of Artaxerxes, 458 or 445 B. C.
Added to 7 weeks and by using “prophetic years” ends at the triumphal entry. The prophetic clock stops. The parenthesis between the 69th and 70th week begins. Roman destruction of Jerusalem by Titus, 70 A. D.
Futuristic Tribulation corresponding to the 70th week of Daniel (7 years) which begins after the Rapture of the Church, the closing of the Parenthesis Era, and the resumption of National Israel and Judah’s role as the center of God’s plan in redemptive history. We must leave further analysis of these critical differences in the interpretation of Biblical eschatology and the character of the Kingdom of God as proclaimed by Jesus to future discussions. But I must leave you with two essential closing observations. First, Dispensational Premillennialism and Christian Zionism are incompatible with Orthodox Lutheranism (Augsburg Confession, Article 17). The former’s adherence to a doctrine of racial supremacy, a commingling of Law and Gospel, and a confusion of the kingdoms of this present realm with Christ’s Kingdom, are anathema to what Jesus taught about His Kingdom, its eternal character, and the universal eligibility of all to receive His gifts and promises. And the United States is yet to experience the tragedy of being linked as a nation to ongoing support of this monstrous heresy in the political, economic, and military realms. That tragedy shall be proven both catastrophic and apocalyptic in its implications. You can take that prediction to the bank, if there is still one left in your community in the next several years. . . .
Second, everyone in attendance today at this gathering, as well as many others who will be connected to our conversations in Cyberspace, must encounter the work of the late Westminster/Princeton scholar Oswald T. Allis published on this subject in 1945. His book, Prophecy and the Church, will demonstrate beyond a shadow of a doubt that the interpretative scheme of John Nelson Darby, the Scofield Reference Bible, Hal Lindsey, and John Hagee, is incompatible with the Lutheran and Reformed streams of the Protestant Reformation and their respective Confessions of the 16th and 17th centuries. The Remnant Confessing Church of our Lord ignores this warning at its peril. The AALC drove through this stop sign many years ago, when it officially recognized a Christian Zionist ministry as its own affiliated organization, one of the many egregious errors made in the initial years of the Minneapolis meetings which taken in the aggregate, spelled disaster and shipwreck. Let there be no mistake. No orthodox Christian of any stripe, including the Confessional Lutheran, believes that the Church of Jesus Christ is a mere parenthesis in history in God’s exclusive dealings with racial, national Israel. No one can compatiblize this with the witness of the New Testament. As Dr. Allis testifies in his magnum opus, to believe this is to ultimately revert to Judaism. The implications of all of this for the future direction of the AALC would be subsequently chronicled by me for the Lutheran weekly, Christian News, in February of 1994 in a front page story entitled, “The AALC: Not an Option for ELCA Conservatives.” I have brought copies of that piece with me today for those interested. It will cover in greater detail the particulars of the time in which I was barely surviving the assault, along with Pastor Spears, Pastor Erickson, Pastor Klug, and Pastor Brostrom. I say barely surviving as my own congregation, St. Matthias Lutheran Church of Seattle, was being rent asunder by the infiltration of the same forces that had begun to permeate the national body. This was covertly being aided and abetted by two different officials of the AALC, as was documented at the time. By the decree of the Executive Committee of the AALC undertaken in between national meetings of the Joint Council and the Board of Trustees (of which I was a member), financial subsidy was being silently provided for what had been covertly transpiring in the Emerald City under radar. The only Early Warning System I possessed that I was in the crosshairs was provided by phone calls of concern from the then President of the Lutheran Bible Institute in Issaquah, and an ELCA pastor in the Puget Sound area who had inside information for me that connected all the relevant players in this Demonic Subterranean Netherworld, their past history, and current informal reports from the Midwest being conveyed to him by his own sources on a regular basis. Translation: I had been the leading voice in closed door meetings in the Twin Cities expressing opposition to the national drift I saw in the organization’s decisions being made by its Executive Committee, its Joint Council, its Board of Higher Education. It was time that I be disposed of. The table had been set. I kept asking myself in the middle of the night, “Could all of this really be happening to me after two years of service to the national organization, and with the friendships developed with key people in Minneapolis?” I was stunned. But every piece fit. The Watchman had let his guard down. He was in the crosshairs of forces he had failed to anticipate and identify. An excruciating price would be paid for this lack of vigilance. The spinoffs continue to the present day. The lesson is clear. The Watchman and The Remnant can never let their guard down. Failure to keep this lesson Front and Center is a catastrophic and potentially fatal mistake. I will be forever grateful to Pastor Dennis Brostrom and Pastor Ray Klug for their official expressions of public dismay over this situation, along with Mr. Rod Kirchoff of Fairbury, Nebraska. Mr. Kirchoff led an official inquiry into events in Seattle when commissioned by the Executive Committee of the AALC to do so. His conclusions were submitted to that body before both he and the Fairbury, Nebraska congregation joined Pastor Klug in leaving the AALC formally. Pastor Brostrom also departed for other confines. Other people presently in this room today would also eventually head for the exit. I would leave the AALC officially after their 1990 National Convention at Northwestern College in St. Paul, Minnesota. Five (5) years later, I would accept Pastor Ralph Spears’ invitation to join the new LMS-USA at its launching in Indianapolis in 1995. I have remained with all of you all these years since (17 years), out of conviction that this body represents a slice of The Remnant in these final days, even as I seriously doubt that a Second Reformation will ever grip this country or the post-Christian societies of the Western World generally. I have also remained in the LMS-USA out of eternal personal gratitude that Pastor Spears and Pastor Erickson understood the magnitude of the personal tragedy I had experienced in Seattle in 1989-90 and did not leave The Wounded Watchman by the side of the road. They have been sources of encouragement and support in the Lord ever since. You can’t buy friendships like these over the counter. What then, are the other lessons derived from this brief Journey into the Past, both for today’s Watchmen and The Remnant? For this, we return to where we began today, with the books of Habakkuk and the Apocalypse of John. I hope the charts provided to you are helpful here. Ministry in days of Judah’s “death throes.” The reign of Jehoiakim (609-597 B. C.) leads to destruction (2 Kings 23:34-24:5; Jeremiah 22:17). John exiled to Patmos by Emperor Domitian’s decree (A. D. 81-96) and after the national judgment of Judah and its Temple Destruction in A. D. 70, as prophesied by Christ (Matthew 24). Ministry in days of America’s “death throes.” Fill in your own contemporary particulars. . . . Roe versus Wade, national embrace of sexual perversion, national debt, crime, family disintegration, over extension of military empire abroad, New World Order, embrace of a deceptive and evil alliance with the Synagogue of Satan (Revelation 2: 9 with reference to Romans 2: 28-29), et.al. Church mirrors the nation with its higher Biblical criticism, embrace of sexual perversion, cultural accommodationism, corrupt leadership, financial greed, lack of love. Ephesus, Pergamos, Thyatira, Sardis, Laodicea or a combination of them (see Revelation 2: 1-3: 21) are today’s American church, including the institutional Lutheran version. Fill in your own contemporary particulars. . . . Who will it be? What configuration of world powers and forces? Habakkuk means “One Who Embraces or Clings.” See 3: 16-19 for the Prophet’s decision to Cling to God in all circumstances. The circumstances for Habakkuk, Judah, and Babylon sometimes appear to contradict God’s revelation, His power, His purposes, His promises. Circumstances surrounding the institutional church and the nation sometimes appear to contradict God’s revelation, His power, His purposes, His promises to you and me. Habakkuk has extended dialogue with God (2/3 of entire book). First dialogue (1:1-11); second dialogue (1: 12-2: 20). Watchmen and Remnant must “Pray Without Ceasing“ (I Thessalonians 5: 17). Perplexity over God’s purposes causes Habakkuk to stand upon a watchtower to wait for God’s reply. God’s reply is plain (2: 2), for an appointed time (2: 3), guaranteed to come and truthful (2: 3). 5 Woes are pronounced upon the guilty (chapter 2). Watchmen and Remnant must be the Churches of Smyrna and Philadelphia in the 21st century. God’s people must overcome in the midst of adversity, trial, and exile. The Watchmen and The Remnant must overcome (Revelation 2 and 3). The mandate is given to all 7 Churches of Asia Minor in Ephesus, Smyrna, Pergamos, Thyatira, Sardis, Philadelphia, and Laodicea. [Brief summation of main highlights of the chart with attendees]. For the sake of time, I will now permit all of you to comprehensively digest the chart’s entire contents in the days ahead. And as this may well mark the last time I address a national Lutheran gathering of this type, given present conditions in the world, let me leave my segment of this program today with a final thought (s) for The Remnant, based on the last theme of the chart. The Watchmen and The Remnant must overcome. Strong’s Concordance on the Internet at http://concordances.org/greek/3528.htm explains the meaning and nuances of the word used by Jesus for His instructions to each of the 7 Churches of Asia Minor in the Apocalypse. The Greek word is [(nik-ah’-o)]. You and I are now in the very beginning of the ultimate battle in world history forecast in the Olivet Discourse and by John on Patmos. The blackening darkness accompanying the emerging rule of The Beast proceeds apace (Revelation 13). The enemies of Jesus Christ and Biblical witness are many. Some are external threats. Others are ravening wolves in sheep’s clothing in our midst (Matthew 7: 15). We have already discussed some examples of this from a quarter of a century ago. I will simply say this as a Lutheran pastor whose lifetime and ordained ministry have coincided with our perilous collective course. As far as the Confessing Church in America in the 21st century is concerned, we are not simply losing. We have already lost. I agree with the prevailing published secular analysis and consensus which flatly states that the United States and Europe are post-Christian societies. The evidence of this is Legion: The decline in preaching and teaching in our churches that is based in solid Biblical exegesis and Orthodox Lutheran standards, increasingly replaced by the Health, Wealth, and Prosperity “Gospel” and entertainment galas; the Church of Jezebel’s accommodation of the greed, narcissism, and perversion which continues to permeates American culture as it has since the salad days of the Drug and Sexual Revolutions in the 1960s; the Culture of Death which continues to abound, symbolized by abortion, Zero Population Growth, euthanasia, and the organized homosexual rights movement; and the ongoing disappearance of healthy young families and communities built around a solid economy and Confessing Church, courtesy of the Globalist movement which underscores the truism that “No man might buy or sell, save he that had the mark, or the name of the Beast, or the number of his name” (Revelation 13: 17). The key for The Remnant is To Recognize. What must we recognize? We must recognize the signs of the eschatological times in world history (Daniel 2, 7, 9; Matthew 24/Mark 13/Luke 21/; I Corinthians 11: 13-14; I Timothy 4: 1-2; I Peter 1: 5-7). We must recognize the reality of the demonic forces at work against the people of God (Ephesians 6; I Peter 5: 8). We must recognize the full implications of our status as a Remnant (Smyrna/Revelation 2: 8-11 and Philadelphia/Revelation 3: 7-13) of the Israel of God (Galatians 6: 16 and I Peter 2: 9-10). We must recognize God’s providential plan and design in both the best and the worst times of our lives (Romans 8: 28, Romans 11: 33-34; Philippians 1: 12). We must recognize that the Remnant Church confounds an unbelieving world and dying culture by preaching Christ Crucified (I Corinthians 1: 17-25) and Christ Risen (Romans 10: 9; I Corinthians 15; II Corinthians 5: 21). We must recognize that the Final Victory is ours (Revelation 22); that we are Conquerors, and that nothing can separate us from the love of God in Christ Jesus our Lord (Romans 8: 37-39). This is the context in which we must see and understand what has happened to all of us in the passage of these last few decades. The American Empire is going the way of ancient national Israel and Judah; the American Lutheran Church’s descent into apostasy, sectarianism, institutional corruption, and increasing irrelevance, accompanies the sick national scene of which it is merely one component in the larger picture. We of The Remnant must Cling to God and His Son. We must Cling to His Word and to His people. We must Cling to a lifetime of prayer and meditation. We must Cling to the Cross of Calvary and the Empty Tomb of Easter Sunday morning. We must Cling to the Promise that the Son of God, presently seated at the Right Hand of God the Father, will soon return for His People and the establishment of a Kingdom Without End. Lutheran Synods are not necessary for this. Neither are District Presidents and Bishops, million dollar church budgets, satellite TV shows with televangelists, church growth demographic chart analyses, endorsements from secular political figures, or subsidies from non-profit organizations and NGOs. These sad sack ingredients are the reverse side of the counterfeit coin which captures the two major secular political parties in America, the corporate news media, Wall Street, and the worst elements of our declining educational system. Why see them as our deliverers from our lamentable individual and collective condition? They are anything but deliverers. They are the ultimate symptoms of a fatal national and metastasizing malignancy which oppress and corrode the souls of God’s people. The discerning will throw them overboard. Paul warns us in the context of his own discussion of the Last Days offered to Timothy that such entities “have a form of godliness, but denying the power thereof: from such turn away” (II Timothy 3: 5). We shall simply take Jesus at His Word with his blessed assurance to the beleaguered Saints of both the 1st century and the 21st: “Fear none of those things which thou shalt suffer; behold, the devil shall cast some of you into prison, that ye may be tried; and ye shall have tribulation ten days: be thou faithful unto death, and I will give thee a crown of life” (Revelation 2: 10). I finally conclude my brief conversation with you today, by coming full circle to where we began an hour ago, with the story of a maritime voyage. It illustrates where you and I are headed together in our present journey. The Final Destination is assured and unmistakable. Be sure of this. This maritime voyage transpired in my Night Thoughts of three (3) years ago, one late Spring evening right after the death of my father in San Antonio. The voyage was a nocturnal reversal of the sad maritime journey I had been forced to embark upon one early Hawaiian morning in the early summer of 1967. In those Night Thoughts of 2009 in the Alamo City, I was suddenly a kid again. I found myself waiting at the Port of San Francisco with my youthful parents and my older brother. We were getting ready to board a ship, by walking up a long and steep ramp. The ship had Matson Lines of Hawaii markings. It was the SS Lurline. My parents and my brother began the ascent up the ramp to board. I felt a hand upon my right shoulder. I turned and saw one who looked like the Ancient of Days. His garment was white as snow; the hair of His head was like pure wool. He was accompanied by the One whose hand was on my shoulder, one like the Son of Man (Daniel 7: 9, 13). The One whose hand was upon my right shoulder smiled. It was a silent but sure reassurance that this voyage of 2400 miles would be a special one. I proceeded up the ramp. The SS Lurline began to pull away from Pier One, the Embarcadero, and the western edge of San Francisco Bay on this early sunlit morning in the City by the Bay. As it did, my eyes focused on the Golden Gate Bridge and the skyline until they disappeared. There was a beautiful Pacific breeze that accompanied the panoramic view. The sun seemed to follow the luxury liner and its occupants across 2400 miles of the deepest blue ocean and whitest crests I had ever witnessed. Five days passed in only an hour, much as one day with the Lord is like a thousand years (Psalm 90, 2 Peter 3: 8). Suddenly the Port of Honolulu swept into view. As the SS Lurline approached Pier 11, the Matson Lines band and orchestra struck up Aloha Oe. A farewell in time had become a greeting in eternity. 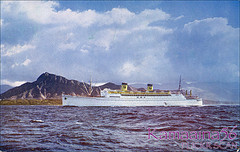 The SS Lurline navigates the east side of Diamond Head in Honolulu. The welcoming crowd was teaming on this sun drenched Honolulu morning. I saw Frederick L. Von Husen front and center among the beaming faces, waving to my family and to me. Then I noticed he was surrounded by other faces I had known my entire life, the faces of people I had always known were among the Saints of God. I had known them in so many different places as numerous as the stars in their courses. Some had preceded me in death and were now alive! Others had not known the sting of temporal death, because of the One I had just seen upon departure from the Port of San Francisco only an hour before. But how could we have crossed the Pacific so quickly? The Polynesian men and women who comprised the Matson Lines canoe crews were alongside us again. The ladies looked as bright, colorful, and beautiful as they had so long ago. The young men were as athletic and vibrant as they had been light years before in another universe in time. But they were all now waving hello! They were accompanying us to a Pier of Arrival that made up the most joyous scene I had ever seen in my life. And suddenly I knew that my life was not ending but beginning, in a new plane of existence in a new cosmos that comprised The New Heaven and The New Earth. 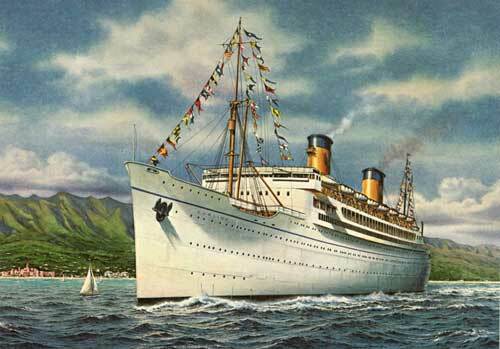 SS Lurline arrives at the Port of Honolulu. Pier 11. Amidst all of the tears of joy and the embraces that enshrouded me in the love of the Saints who had come to the Pier to greet me, I was suddenly in the presence again of One Like the Son of Man. But lo and behold, He is the Son of Man and the Only Begotten Son of the Father! His Legions of Angels surround him in an aura of Radiant Light! It is the Light of the Living Lord! It is the Victory of the One who Has come as He has promised! And His people are the Victors, the Conquerors, the Ones Who Have Overcome in the Blood of the Lamb! The Dragon, the Beast, the False Prophet, the Whore of Babylon, and their followers throughout history are now consigned forever to the Lake of Fire! Death and Hell have been cast into this Lake. This is the Second Death. (Revelation 20). And all of us have a Crown of Righteousness! And all of you today in Chetek, Wisconsin are there! You too departed Pier One, the Embarcadero, the western edge of San Francisco Bay with me, on a most glorious luxury liner, destined to arrive at a place the world will never know, but which the People of God, the New Israel of God in Christ will live in forever and ever! The Port of San Francisco on a clear day. 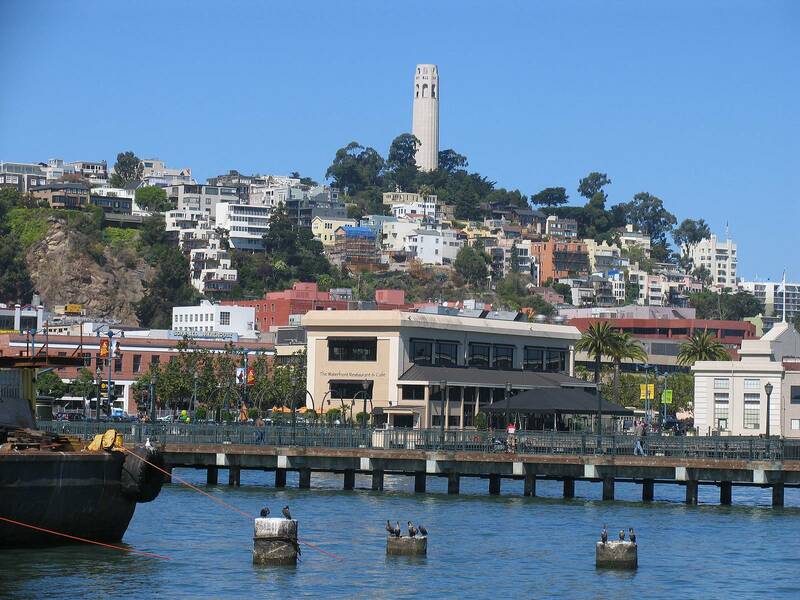 Coit Tower remains on watch. “For I am now ready to be offered, and the time of my departure is at hand. I have fought a good fight, I have finished my course, I have kept the faith. Henceforth there is laid up for me a crown of righteousness, which the Lord, the righteous judge, shall give me at that day: and not to me only, but unto all of them also that love His appearing.” (II Timothy 4: 6-8). “And I John saw the holy city, New Jerusalem, coming down from God out of heaven, prepared as a bride adorned for her husband. And I heard a great voice out of heaven saying, Behold, the Tabernacle of God is with men, and He will dwell with them, and they shall be His people, and God Himself shall be with them, and be their God. This is your destiny. This is my destiny. It is by the grace of God alone, Christ alone, and faith alone. The Holy Scriptures testify to these truths. Do not doubt these truths, but cling to them. Your redemption draweth nigh in these dark, final days of human history. “Ye are all children of light, and the children of the day: we are not of the night, nor of darkness. Therefore let us not sleep, as do others, but let us watch and be sober. For they that sleep sleep in the night; and they that be drunken are drunken in the night. “But let us, who are of the day, be sober, putting on the breastplate of faith and love; and for a helmet, the hope of salvation. “For God hath not appointed us to wrath, but to obtain salvation by our Lord Jesus Christ. Who died for us, that whether we wake or sleep, we should live together with Him. God bless you and your household this blessed day. I bid you farewell. 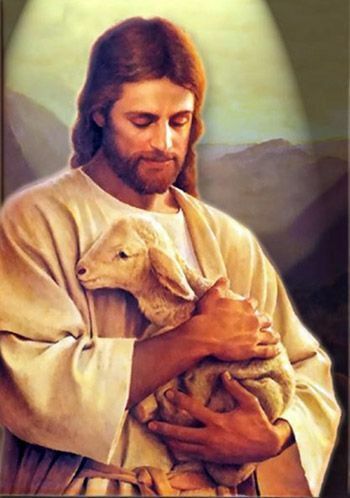 The Lamb of God, Jesus Christ, awaits us.